Mr. Richard Clayton Singleton, 69 of Livingston departed this life on Monday October 1, 2018 at his home. He was born in Dayton, OH on January 4, 1949 the son of Richard and Bessie Daugherty Singleton. He had been a truck driver for Carpenter Trucking and was a loved the outdoors enjoying hunting, fishing, and camping. He is survived by his loving wife of 50 years, Rebecca Overbay Singleton; his children, Elizabeth and James Scalf, Victoria and David Tincher, and Robbie Singleton; a brother, Bobby Singleton; three grandchildren, Brandy Bowman, Matthew Tincher, and Faith Tincher; four great grandchildren, Lillie, Tucker, Mollie, and Raelynn; and a special nephew, William Singleton. 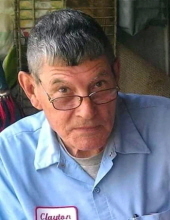 In addition to his parents, he was preceded in death by a grandson, Steven Charles Scalf; a brother, Jimmy Singleton; and a sister, Donna Lee Singleton. To plant a tree in memory of Clayton Singleton, please visit our Tribute Store. "Email Address" would like to share the life celebration of Clayton Singleton. Click on the "link" to go to share a favorite memory or leave a condolence message for the family.